powered higher to 9.8 million barrels per day (mbpd) despite oil-drilling rig count declining from 749 on December 1st to 747 on December 29th. I often show the grap h to the right because the markets seem preoccupied with more transitory and emotional factors such as weather and geopolitics. 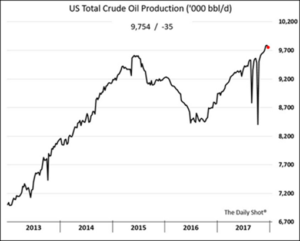 Simply put, U.S. crude oil production in October rose to the highest in more than 46 years, while natural gas production leaped to a new record, as per the US’ Energy Information Administration (EIA). This factor will not always be the most important for prices but for now best summarizes the supply situation. Note that this is not just true in the US but Canada, Mexico and Brazil are all actively expanding. Outside the western hemisphere, Russia had record output in 2017 (averaging 10.98 mbpd) and would like to extract more, despite current cuts in conjunction with OPEC. Brazil’s 2017 production average through August (3.3 mbpd) was already above the 2016 average, demonstrating its growth. Furthermore, the US production is growing despite a stagnating count of drilling rigs in operation. Efficiency, at least domestically, is a key part of the market balance. Looking ahead, the EIA projects total 2018 US production averaging 9.95 mbpd (+0.7 mbpd over 2017) and exceeding 10.0 mbpd in 2018 Q4 (similar to Russia’s current production). With expansion supported in the US (drilled but uncompleted wells (DUCs) soared to a record 7,354 in November), Canada, Brazil and Mexico, the International Energy Agency (IEA) is forecasting an additional +1.4 mbpd on the market by non-OPEC/Russia producers in 2018.
on production cuts with an extension of their agreement through 2018 with the option of an early exit in June (or cheating before then). Russia in particular has been making noises about wanting to expand production, especially as they opened a second pipeline into China on New Year’s Day, doubling China’s capacity to import crude oil on this single pipeline to about 0.6 mbpd. OPEC official estimates for 2018 global oil demand are lower than the EIA’s by a substantial 1.5 mbpd. OPEC therefore is claiming that it can keep its cuts lower for longer. The US’ numbers, on the other hand, imply that OPEC is undershooting demand in order to more easily lag their production and thus boost prices. The way the Venezuelan production is heading (lower) and the country’s ongoing legal entanglements (higher) imply that production is more uncertain. The Chinese are finally getting fed up as leading Chinese oil firm Sinopec sued PDVSA over nonpayment for steel rebar (the case has been settled but will China want to add to its $60 billion in Venezuelan loans now? I think not). Venezuelan exports to the US have fallen to the lowest level since January 2003, with Iraq stepping in to fill the hole. That is permanently lost hard-currency revenue for the beleaguered state. Additionally, Reuters reported that PDVSA is in danger of losing licenses for storage facilities in the Caribbean where PDVSA has mixed oil to meet specifications for export. Who is the main customer of those shipments? PetroChina. Strike two! Russia has stepped up to the plate by signing an agreement to restructure $3.15 billion of debt owed to it by Venezuela, which spreads the loan payments out over a decade, with “minimal” payments over the first six years. Balloon payments killed the US mortgage bubble, remember! Can the floundering country recover? Maduro’s “solutions” were to arrest six Citgo (the US arm of PDVSA) executives and install the military to run the company, and to try to launch a crypto-currency backed by… Venezuela’s non-existent surplus oil. Call me skeptical, but I do not see improvement on the horizon. their crude oil imports in November rose to 9.0 mbpd – up from 7.3 in October – and to the 2nd highest level on record. With the IMF projecting a very strong global GDP growth of +3.7% in 2018, the global call on crude oil seems strong. Saudi Arabia announced further progress on its pending Aramco IPO later this year so that support under the crude oil market is still in place. Those wondering about Russia’s oil production capabilities should look to their natural gas production and exports – the latest numbers show that output jumped 7.9% to beat a 2011 record primarily on European and domestic demand. Furthermore, Chinese exports are slated to begin in 2019 upon a pipeline’s completion. Investment to expand production continues so this will challenge other LNG exporters Qatar and Australia (and to the US to a limited extent) over the next few years. Lots of Beans… and Corn and Wheat! Stockpiles of U.S. soybeans and wheat are expected to rise due to lower export demand amid heightened competition from rival global suppliers per the USDA. Right on cue, Brazil’s association of oilseed processors Abiove on Tuesday raised its projection for the country’s soybean exports in 2017 to a record 67.8 million tonnes, as demand from China remained heated. Looking ahead, the Brazilian consultancy Safras downgraded fractionally its soybean production estimate for the 2017/18 crop to 4.2 billion bushels from earlier October estimates. Farmers are expected to plant about 5% more soybean acres but weather conditions are not projected to be as perfect as the previous cycle. The wheat situation also looks plentiful as Russia’s Federal Statistics Service issued a preliminary harvest estimate that showed the nation collected a record 85.8 million tons of wheat, exceeding expectations. Livestock availability is also growing with the USDA increasing US 2018 production by 1.2 billion pounds (+4.6%) to 27.7 billion pounds versus last year on larger placements and heavier weights than 2017. Pork production is also making a similar increase in 2018. The US export market also saw stronger competition in meats from Brazil, with their beef export projections expected to be up 10% to 1.68 million tonnes.